Clover sprouts, which look like this, have been linked to probable cases of E. coli illness. The Washington State Department of Health is warning people not to eat raw clover sprouts from Idaho-based Evergreen Fresh Sprouts. The sprouts have been linked to seven confirmed and three probable cases of E. coli illness in Washington and Idaho. There have been no deaths. The sprouts linked to illness were consumed at Pita Pit locations in Spokane County, Daanen’s Deli in Hayden and Jimmy John's locations in King, Spokane and Kootenai Counties. Evergreen also distributes to grocery stores for home consumption and the Department of Health is warning people to throw those out if they have them at home. As indicated in the release below and by the federal government, sprouts can be risky because they need a warm and humid environment to grow, and that's the same environment in which bacteria can thrive. 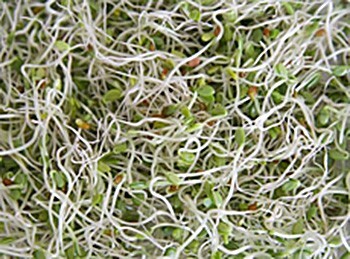 Back in 2011, the same Idaho-based company voluntarily recalled alfalfa sprouts and spicy sprouts after they were linked to Salmonella infections across five states. OLYMPIA ⎯ An outbreak of E. coli cases led state health officials to warn consumers not to eat raw clover sprouts from an Idaho producer. The sprouts under investigation are linked to seven confirmed and three probable cases of E. coli O121 illnesses in Washington and Idaho. Five of those patients were hospitalized; there have been no deaths. Five cases were reported in Spokane County, two in King County, and three in Kootenai County, Idaho. Results from initial investigations indicate a strong link to eating raw clover spouts produced by Evergreen Fresh Sprouts, LLC of Idaho. Sprouts were eaten in sandwiches at several food establishments including Jimmy John’s Gourmet Sandwiches locations in King and Spokane counties, as well as two Pita Pit locations in Spokane County, and Daanen’s Deli as well as a Jimmy John’s location in Kootenai County. The restaurants where the cases reported eating raw clover sprouts have voluntarily suspended serving sprouts. The producer also distributed sprouts around the northwest to other restaurants, as well as retail grocery stores where consumers may buy them for home consumption. While the outbreak appears to be linked to clover sprouts from Evergreen Fresh Sprouts in Idaho, the source of the sprout seed hasn’t yet been determined and remains under investigation. The type of E. coli in this outbreak is a strain of Shiga toxin-producing E. coli (STEC O121) similar to E. coli O157:H7. It can cause bloody diarrhea, abdominal cramps, fever, and vomiting. It can sometimes result in severe, life-threatening illness and may be fatal. Local and state health officials in Washington and Idaho are investigating, working with the U.S. Food and Drug Administration and the U.S. Centers for Disease Control and Prevention.Sprouts are a known source of foodborne illness. Seeds and beans need warm and humid conditions to sprout and grow. These conditions are ideal for bacteria growth. Since 1996, at least 30 nationally reported outbreaks of foodborne illness associated with different types of raw and lightly cooked sprouts have occurred. Most of these outbreaks were caused by E. coli and Salmonella. In most sprout outbreaks, the restaurant is not the source of the contamination, which usually happens when the seeds are grown or harvested and is often impossible to wash off. It’s important to store sprouts in a refrigerator to inhibit bacterial growth. Thorough cooking will kill the bacteria.